The Red Lodge Clay Center is pleased to present the Cup de Ville, a solo exhibition by Jeremy “Jr.” Kane. 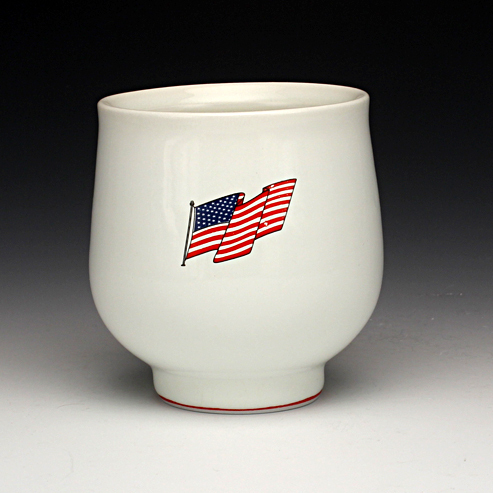 His finely crafted porcelain mugs and cups line the gallery walls and present an array of Americana imagery on the smooth and slick forms. The mugs become reminiscent of classic diner functional ware from across the country, only to be branded with his name and quintessential logo. The glossy white surface of the glaze provides a canvas that allows the imagery to pop, stand out, and become the focus. Pin-up girls in red bikinis pose next to the American flag, glancing over their shoulders. Hunting scenes, farm animals, guns, and decks of cards reference blue-collar Americana and nostalgia that have become a reference and fascination for him. Stripes in red, blue, and gold adorn the mugs near the bottom edge and circle around the form. His iconic flame decals finish off the mugs in true Jeremy Kane fashion and have become a type of signature for the artist.